The first day of each year is a starting block. Like the ones used to position sprinters, I brace against it and breathe, waiting for that starter pistol. The last two years, the block has been more of a chock block – the kind you use to keep a truck or airplane from wandering off on an adventure of its own sans chauffeur. And certainly, there have been moments – no, lengthy time spans – in which the blocks got pulled out and I wondered who was driving this buggy. When I would reflect, it seemed to boil down to practice. What was my practice? What was I practising? 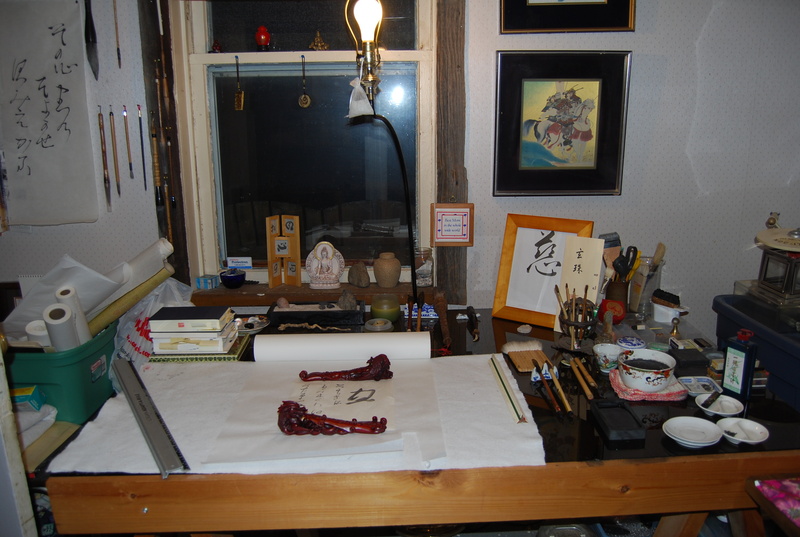 For all the dedication to formal and informal practice, it seemed there was an accumulating incongruity between areas of my life and between the inner and outer practitioner. In the Fall, Frank and I made the tough decision to move sangha to our farm. The decision has been two years in the making and yet it was likely the most painful decision I had to make. (I say “I” had to make because Frank has been more reasoned in his process of letting go although I don’t think it was any less difficult.) We shared our desire to make the move with sangha and, as is often the case, the heart-words were inexpressible. What came out and what was heard was a litany of “can’t” – a can’ticle of rationales? In end, we expressed it as this: our deepest aspiration is to create a sacred space in which the joys and suffering of all who visit can be cooked into a strong broth of well-being. To do that we, as a couple and as community leaders, need to be in a space that encourages practice. We need to approach the hour of formal practice steady and quiet in our being. 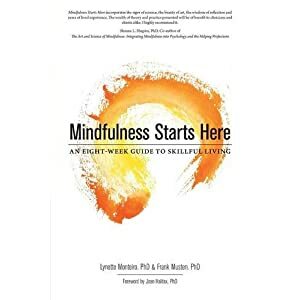 It seems selfish and self-serving but the alternative is an edge to our leadership that violates the Prime Directive of Practice: “…help… but at least do no harm.” What we needed to create for our personal path was a space in which practice can become habit-forming. So, on the first morning of the this new decade, the starter pistol fired and I set out to clear space. 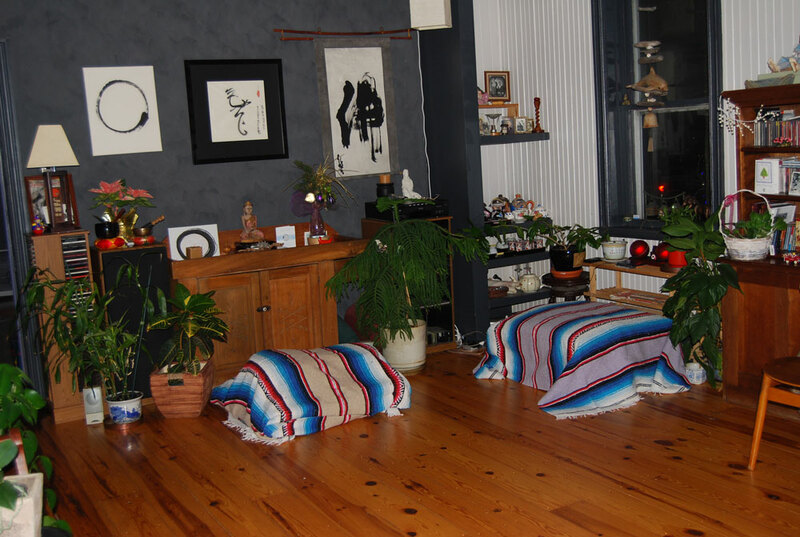 The zendo, as you’ve seen is already set up. 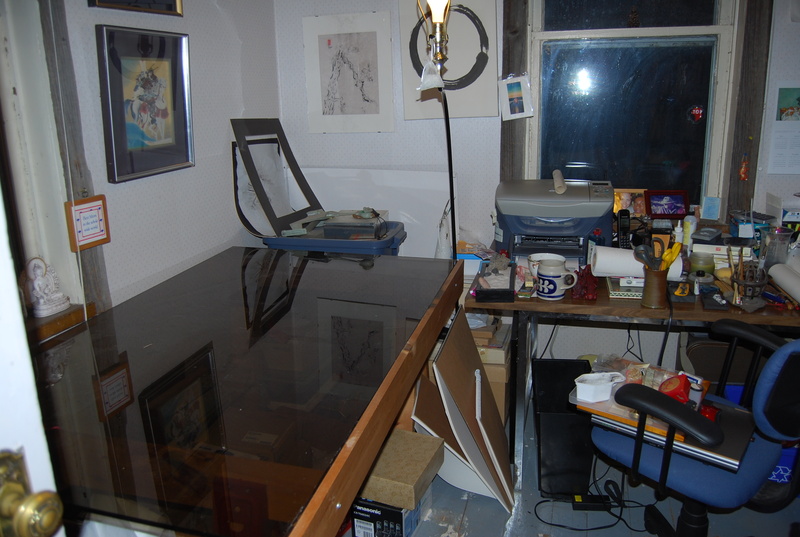 But my personal practice space – for what Sher calls “invisible practice” – was a mess. It reflected two years of surrendering to chaos. 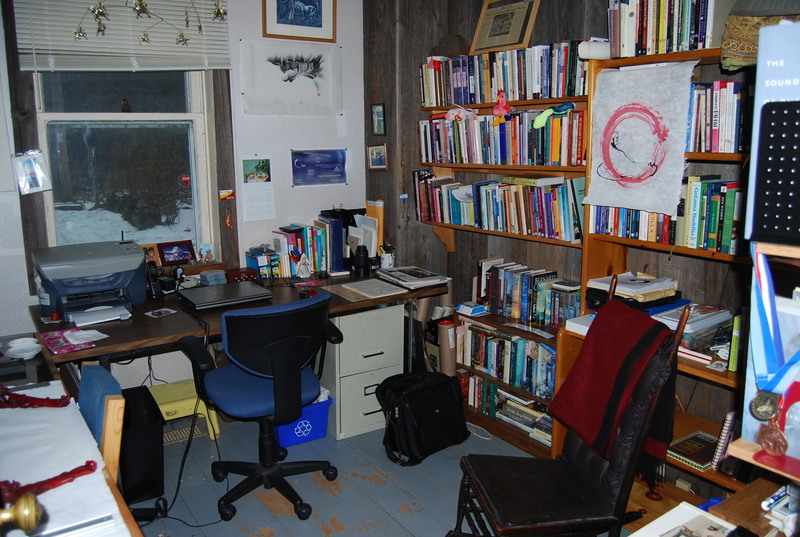 Because the zabutons and zafus needed a home, they took up the shelves and nooks and crannies of my study. Books, art materials, recycle bins stuffed themselves into whatever horizontal openings were left over. It is not possible to be authentic in my formal practice if the rest of my life qualifies for an episode of “Hoarders.” When the principle guiding my life is one of disregard of well-being, then any truth I may speak is automatically a lie. The order of the table is comforting, like the rituals of offering incense, bowing, and dedicating merit. Sher quotes Issan Dorsey on cleaning: “You just go around and make things look like somebody paid attention to them.” Paying attention to the spaces that feed me, interestingly, generates a readiness in me to be fed, to receive the feeding (paraphrasing Edward Espe Brown). Notice the stack in front of the altar. That’s our two Z’s for practice every morning. No quarter given! This entry was posted in Western Teachers and tagged Gail Sher, practice, sangha arana. Bookmark the permalink. Gassho, Lynette. I’ve listed your blog on http://www.canadianbuddhism.info but I would like to include what city/province you are in. Where are you located? Congrats on your recent kudos! Thank you! I’m in Ottawa ON. I’d appreciate a listing of our sangha’s blog http://www.sanghaarana.blogspot.com (Sangha Arana is already listed in your directory). It is located in Navan/Vars/Cumberland and area. Nice post about taking care of the big things that really matter, and attending to small everyday tasks that make up looking after the greater good. Great reminder to start the new year. I love this line: “Issan Dorsey on cleaning: “You just go around and make things look like somebody paid attention to them.” Cleaning and tidying are tasks I love intensely, now I know why!